0800 1814045, and our professional advisors will be pleased to assist you. All images, descriptions and contents on the Sofa Bespoke website are the intellectual property of Sofa Bespoke and shall not be altered, amended or copied at any time. We reserve the right at our sole discretion to omit or add contents to our website at any time. Special offers are made to the public as recognition of their valuable custom with us. These special offers shall not be extended to our normal products. Any special offers can be withdrawn or amended at our sole discretion at any time. We take all reasonable care to ensure that all details, descriptions, images and prices appearing on the website and in any company communication are correct. Any error or omission shall be subject to correction without liability. Photographs are for illustrative purposes only and may not exactly match the product itself. Sofa Bespoke advises our customers to carefully read what is included in an offer. Any item not included in the description is not included in the offer. Extra cushions will not normally be included, unless mentioned in the description. If complimentary cushions are included, they may be in a different design. If you need any clarification, please contact us. Distant selling Regulations shall not apply to our “Made to measure” and non stockiest items. We advise our customers to fully understand that once these items have been manufactured they cannot be returned unless a structural or manufacturing fault is proven by our service team. 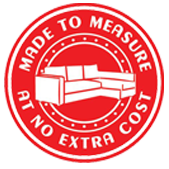 We adopt a transparent and mutually agreed procedure for “made to measure” sofas by ascertaining our customers’ requirements e.g. size, colour, sofa made opposite to pictured on the website, different shape and any other alteration. When requested we can send you a professional diagram and colour swatch electronically, before you confirm your order. We require a 30% non-refundable deposit of the total invoice value of “made to measure” orders. If “made to measure/made to order items” are cancelled, Sofa Bespoke will not refund the initial 30% deposit. A minimum period of 8 weeks is normally needed for “made to measure/made to order items”. Sofa Bespoke takes no liability for any delay due to shipping, port or cargo problems. We offer a two men professional delivery service to the ground or first floor only. If delivery is for other than ground or first floor, Sofa Bespoke needs to be informed prior to delivery as extra manpower may be needed. We aim to deliver your purchased items within seven working days within main land England, for our express 24 hours and 48 hours delivery service please call our office. An additional charge will be applicable for our express delivery service. It is the customer’s responsibility to ensure any furniture purchased can pass through doorways, hallways, rooms and staircases. In the event of restricted access the delivery staff will leave the goods at the nearest convenient point. It is not the responsibility of Sofa Bespoke to unpack or assemble furniture in locations that have no reasonable access for the items being delivered. Sofa Bespoke requires the customer or their agent to be present for the delivery of their goods as some assistance may be needed. Sofa Bespoke cannot take any liability for failed delivery in the wake of in access. Our dispatch team will call you at least 2 days prior to delivery, with a proposed day and either am or pm delivery time block. Sofa Bespoke cannot offer a specific time of delivery, due to traffic. Minimum delivery charges apply to mainland England. But an additional surcharge is applied for Scotland, Wales and postcodes IV, KW, PA, PH and AB. Please call us for a quote before delivery. If you want to change or cancel your delivery date you must notify us 2 working days before delivery as orders are collected by our couriers in advance. Failure to do so will incur the full delivery fee. This will be deducted from your refund if you choose to cancel your order. If your order doesn't fit into your room or doorway, or if there is no suitable access for the delivery vehicle, resulting in your goods not being delivered, you will incur the full delivery fee. You must provide us with a contact number, so Sofa Bespoke can contact you to arrange delivery. You must check your order confirmation email to make sure we have your correct address, order, and telephone number. You must provide us with directions if your address is difficult to find as failed deliveries due to this will incur a failed delivery fee. For security reasons a signature is required upon receipt of your order. Sofa Bespoke work hard to keep our delivery promises, however delays can occur that are outside our control, we will not be liable for any late or missed delivery. On the day of delivery, our delivery driver will text you (provided you have given us a mobile number) to keep you informed on an estimated time of arrival. Sofa Bespoke use outside contractors for our sofa deliveries and we do our best to ensure they maintain very high standards. But they are not our employees and we cannot be held liable for their behavior and manner. All packaging is left with the customer to dispose of and is never removed or taken away. Items must be returned in their original packaging. You must notify us within 48 hours on receiving your items of any fault, damage or mistake. Sofa Bespoke will conduct an immediate inquiry to determine the full extent of your dissatisfaction, liability and seek to resolve any issues. It is the customer’s responsibility to check and to inspect their goods. It is the responsibility of the customer to point out any damage or fault while the couriers are present, as any damage due to delivery needs to be proved. If goods are to be returned at a later date, all items for return must be unused, unopened and in full original packaging. You must ensure the item is ready for collection prior to the vehicle arriving, in its original packaging. Failure to provide the original packaging will result in a repackaging cost. Please call our office for the cost and to arrange re-packaging. On collection, the item/s will be inspected for any damage or wear. If found, photographs will be taken, details will be noted on the collection note, which you must sign. If damaged or worn, Sofa Bespoke can only repair and sell the item on as second-hand and then refund to you the net proceeds of this sale. A full refund (net of any appropriate delivery and collection fees) can only be given when the item is collected in undamaged and unused condition and in its original unopened packaging. We will only attempt collection twice, both incurring a collection fee. After this we will not try again and you will no longer be entitled to a refund. Refunds will be processed after the items have been returned to us. Delivery charges will not be refunded. Warranty shall not extends to items on Display and Clearance Sale. We request all our customers to thoroughly inspect your goods upon delivery and sign a delivery note to show you are happy with your delivered item/s. We cannot accept liability for any damage reported to us due to delivery at a later date. You must call us while the courier is still there if you wish to return the item. We will require photos showing the damage or fault before we can determine the best course of action. Damaged or faulty products will be repaired to the highest standard as soon as possible. All our products come with a 1 year manufacturer’s guarantee unless otherwise stated. Clearance items are not subject to returns or exchange and are not covered by any guarantee. We will make every effort to fulfill your order however we reserve the right to cancel a contract at any time and will not be liable to you or any third party. We also reserve the right to refuse any transaction or refuse service to anyone at any time at our sole discretion. Sofa Bespoke shall not be liable to you for any indirect or consequential loss or damage arising out of any problem you notify to us. We will have no liability to you for any failure or delay in delivering goods or any damage or defect in goods delivered which is caused by any event or circumstance which is beyond our reasonable control. Fees charged by paypal on transaction or by bank on credit card is liable to be paid by the customer.